Call us today for a free estimate! We take all major credit cards. 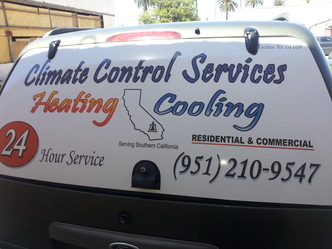 Climate Control Services Heating and Cooling (CCS) provides exceptional customer service to install or repair your air conditioning and heating units quickly, efficiently and courteously. At CCS, we know how important it is that you trust the technicians you invite into your home or office. We pride ourselves on the character and integrity of our staff and technicians. Not only do we have extensive experience and skill, but our technicians are attentive and personable to ensure that you know how important you are as a customer. We take time to listen to what you want so we can solve the problem in the most economical and efficient manner possible. At CCS, we save you time, money and stress because we do the job right, the very first time. Not ready to purchase a brand new system? No problem! If it can be fixed, we will fix it! Our professional technicians are familiar with many brands and models of HVAC systems and strive to meet your needs, whatever they may be. We create the Perfect Climate for you.